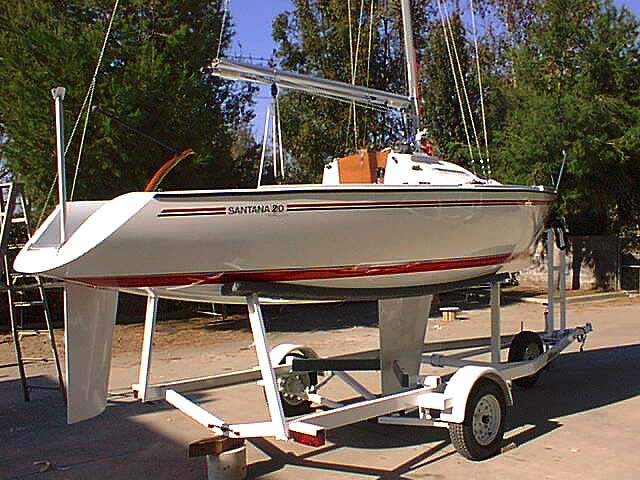 Tom Schock unveiled his new boat (Hull #900) at the S20 Nationals in Eugene, OR in 1996. It's taken me this long to lose the photos, find them, and scan them in. So now that this boat has won the 1997 Nationals I guess it's time for the world to see the boat up close. These first two shots show the major design change -- the open transom and the decks rolled down to the cockpit floor. This was intended to give the boat a more modern look and be friendlier on the crew. The left hand photo also has a good look at the new jib tracks. The jury is still out on the placement of them, but the new boats have done well with Tom's placement. Also in the left hand photo you get a good idea of what the boat looks like with the traveller moved forward 9". This next shot is a close-up of the transom showing the detail of the new tiller and how it goes through the floor. Tom has also put a barney post on his boat so the main sheet will always be in the same place. Notice the new backstay and how it is split and attaches to the transom. This shot shows more detail of the control console. Gone are the wood guides for the hatch cover. They have been replaced by a low profile fiberglas "lip" that will hold the hatch cover, but not break when you stand on it. Also missing here is the forward winch pedestals. They were removed since most folks don't use them. This interior shot is taken looking aft into the quarter berth. Notice how the aft quarter berth is much bigger with the new side tanks on the deck. There is a lot more headroom now. You may also see the lead in the keel pan. That was there because the keel was too light when the boat was put together. The crew was working on the boat to add weight right up until the regatta started. That's why the boat was christened "Still Wet". The last shot is taken looking into the starboard side of the V-berth. Notice the cutaway bulkhead. It makes it easier to move around up there and also lets more light in. The bulkheads are now fastened at the bottom with 1/4" bolts and big fender washers. This is a big plus as the boat gets older.